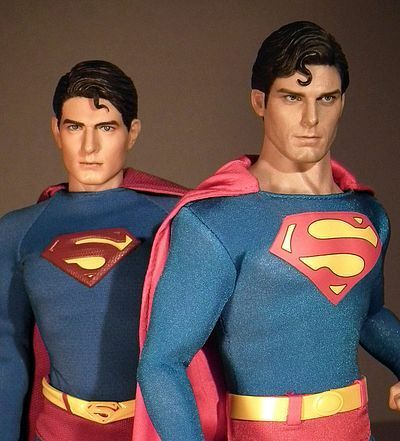 Jeff checks in tonight with a look at the new Hot Toys Christopher Reeve Superman. I hit this guy up just a week or so ago, but it's always valuable to get a Jeff's thoughts as well. Take it away, Jeff! I’m a geek, you’re a geek, that’s why we’re here, and like any self respecting geek who is fully paid up with the geek council/union you will visit Mike’s hallowed shrine to all things geekdom and voraciously devour what is offered up for consumption thrice a week. I however have to sometimes step back… you see if Mike beats me to the drop on a figure (which he often does) I find myself flinching away like a vampire in the sunlight. Not because I don’t trust him… lord knows as far as I am concerned he is the supreme overseer. But I just don’t want to be influenced. It’s akin to Russian roulette; I like to read his thoughts after I’ve passed my own, and then stroke my chin knowingly at the points we converge and diverge. But I can still look at the pretty pictures and bathe in the warm glow of ‘toy love’ that he secretes (that just sounds so wrong). But here we have what is possibly THE most wanted and anticipated figure in a very, very long time! 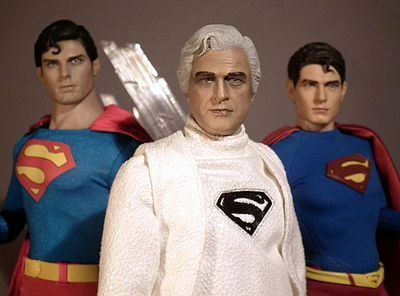 Richard Donner’s Superman: The Movie came out way back in 1978, just a year after the phenomenon that was Star Wars. I only mention this because it was such a big landmark in my, and oh so many other people’s lives. I’d grown up with some pretty amazing movies from Ray Harryhausen and the like, but all of a sudden fantasy films had stepped up a gear, and the ‘summer blockbuster’ was born! And with its birth came a whole new set of incredible special effects, all of a sudden you would believe a man could fly (well, kind of)! 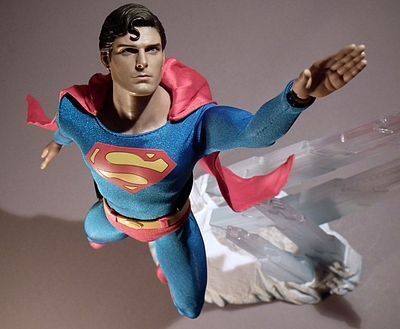 Superman was the springboard that launched Christopher Reeve’s career making him THE Superman for many generations of people. But in a bitter twist of irony, the man who became synonymous with the most noble super hero of all, and the iconic symbol of ‘truth, justice and the American way’ met with a tragic horse ridding accident in 1995 which rendered him a quadriplegic who would spend the rest of his days in a wheelchair and in need of a ventilator. Despite his situation he continued to work tirelessly in raising money for research into his condition right up till his death in 2004. 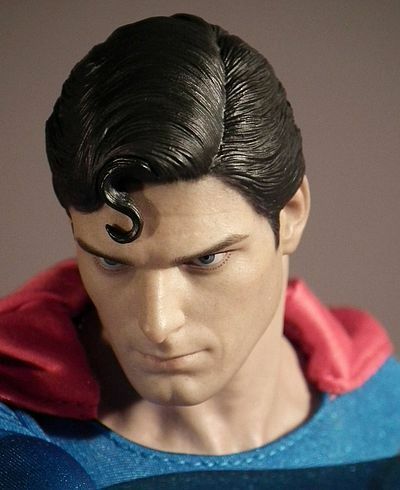 And as a mark of respect this figure is dedicated to the memory of Christopher Reeve and a portion of the money this figure makes will be passed onto the Christopher & Dana Reeve Foundation, the organisation that continues to fund research into spinal injuries and their treatment, ensuring his legacy live on! Because of the tragic manner of Reeve’s death and the delicate nature of his lasting memory, it often seemed that those fans that loved the movies might never get the top quality collectible they yearned for. But then back in May of 2011 Hot Toys finally announced that they had the rights to give us the 1/6th figure we had wanted for so long, and five months later here it is in our hands at last! I love boxes… I just do! I was trained in graphic design but by accident wandered off into the deep dark woods that is illustration. But I still have an eye for a cool and iconic bit of packaging. When images of this figures cardboard can were first released onto the internet a few weeks ago I was gobsmacked… it was just so simple, it was almost asking to be done… but good design is like that, it will out! It was designed by just about my favourite HT graphic artist ‘du jour’ Dixon Chan aided and abetted by Monster Jr (with a special mention for TF Wong for ideas on the 3D concept). So I asked him what the back-story was. He told me he knew the ‘S’ logo was so ‘expected’ he almost didn’t want to use it, he spent time playing with other ideas, but every time it brought him back to that classic and powerful diamond shaped image, and so he eventually gave in and we now have what sits in front of us! The tiny bit of genius (and it only takes a tiny bit) was the maths and paper engineering involved. They took that classic diamond shape and added the extra corner to make it into a rectangle. But that extra corner can then be taken away (in fact it has to be when you unpack it) and then turned inside out to become a mirror image triangular base to hold the box ‘actuale’ within its inverted apex… See what I mean about simple design being the best! So, what’s to be said about it? Well it’s cool. That’s evident by the whole aesthetic of the thing. But the actual construction and functionality is what you guys wanna know. The lid of the box lifts up to show a diamond shaped piece of red card with a list of the creative talent that brought this figure together. Beneath this is another layer of card with a simple inscription saying in memory of Christopher Reeve, then under this are the vac formed plastic trays. 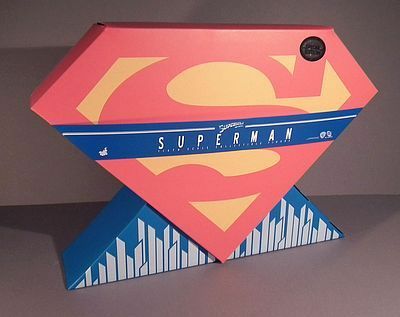 This is the ‘special edition’ so on the first layer in a smaller tray at the front is the crystal of Kryptonite on a chain. The next level holds the figure and his hands and the last lower tray holds all the parts for his stand/diorama. It’s just such a classic bit of packaging that deserves a place in the pantheon of classic ‘pop art’ design… love it! Arnie Kim is one of those few names that is well known amongst 1/6th collectors the world over. He’s part of a rather elite crowd of super star sculptors (well, in the online circles I move in) whose name is synonymous with top quality. I remember seeing his work showcased by Mike in his coverage of SDCC a few years back before he was even signed to Enterbay, let alone Hot Toys. His work on the likes of Bruce Lee and Harrison Ford was the stuff of fan-boy legend. But back then he also exhibited a rather amazing portrait of Christopher Reeve as Superman. Of course EVERYBODY wanted it, but it was a personal project that was never made widely commercially available. And due to the tragic circumstances surrounding Reeve’s untimely death it looked like it was one of those most desired of figures that would never see the light of day. Reeve had a very distinctive clean cut and chiselled face, with lean, tight features. This helped make him look fit and sporty in a preppy, boy-next-door kind of way rather than a bull-necked jock. And that face has been captured to sheer perfection by Arnie in this portrait. The subtle lines around the mouth and cheeks have all been translated well here as has his trademark dimple in the chin. His expression is focussed and determined and the iconic little kiss curl is stuck on virtually seamlessly as a separate piece to add extra depth and authenticity to its look. 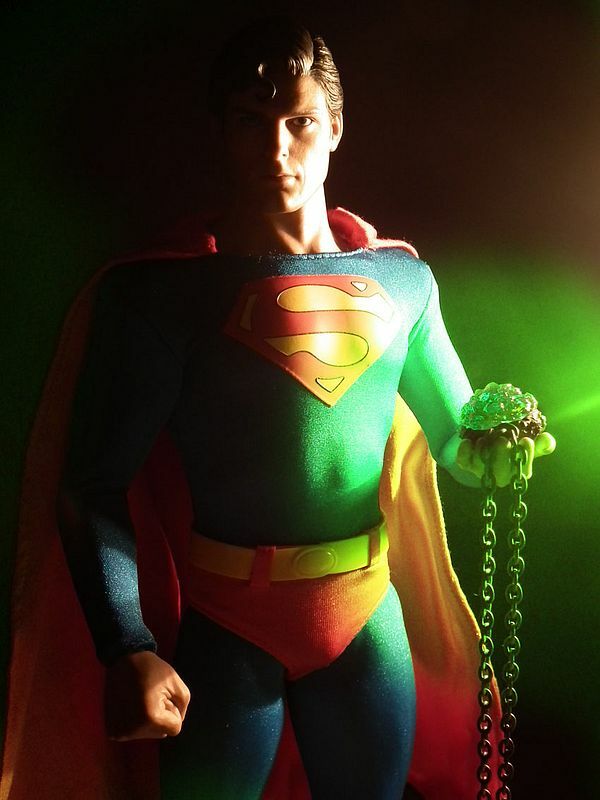 His selection of hands all work well for general standing and flying poses, but I wish there had perhaps been an extra hand for holding the Kryptonite chain… but as that is an exclusive item, perhaps it was a bit of wishful thinking? 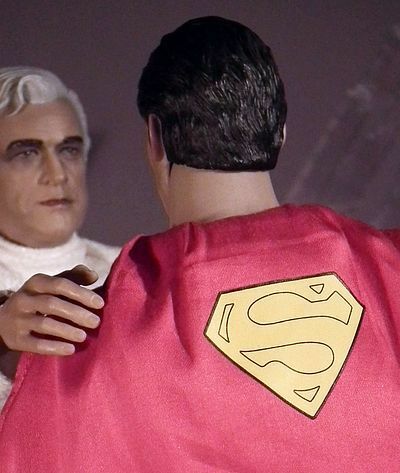 Regardless of my wants for an extra hand the overall feeling for this sculpt is one of sheer delight, as even at its rather hefty price tag it still pisses all over the vastly more expensive Cinemaquette one from a great height, just check it out here... oh dear! 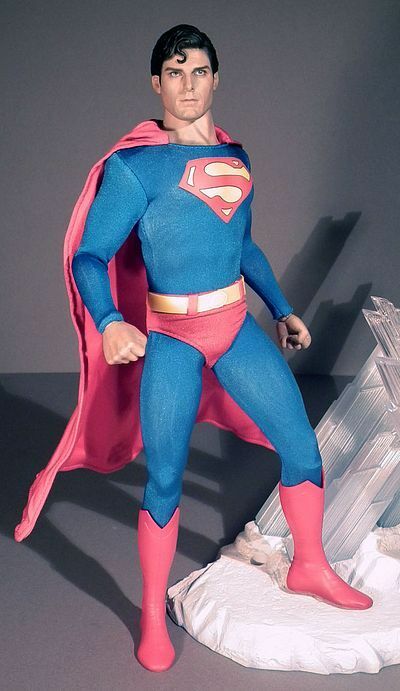 It shows that this one really is rather super and THE figure of Reeve to own if you want the definitive version at this time! 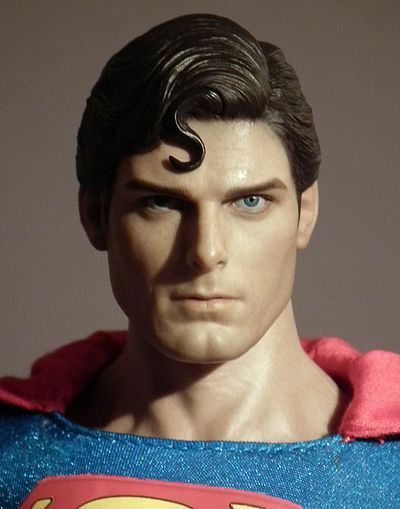 One of the many reasons Chris Reeve was so perfect for this role was his piercing blue eyes, and here JC Hong has captured their intense gaze to a level of perfection demanded by the underlying sculpt. It’s actually just such an amazing paint app that I’m getting to the point where I find it hard to see just how much more they could actually improve at this scale… perhaps that’s the reason they recently announced they were stepping up another gear and indeed size to � scale as well. Everything is just as you’d expect from Hot Toys, the flesh tones are all warm and convincing and the fine detailing is just stunning. Once again the level of realism is like they have simply taken the source material and shrunk it down to 1/6th, and if ever there was an iconic character and actor that deserved this amount of loving care it is Reeve as the Man of Steel. This is a variation on the newer muscle bodies like Wolverine but with more traditional TT arms (meaning a far better range at the elbows and shoulders). 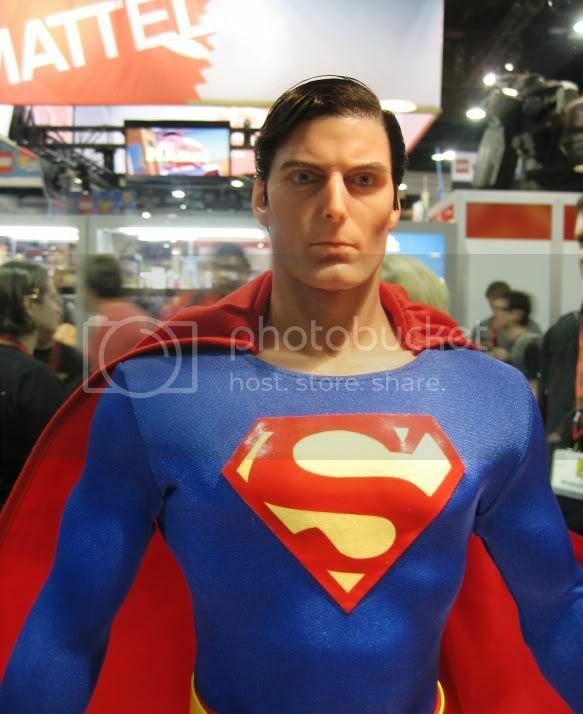 It’s slightly bigger in the pectoral area but is a great representation of how Reeve looked in the movie, i.e. the natural side of muscular without looking like a roided up meathead! I found all of his joints moved smoothly and held the poses they were placed in well. Meaning you should have little or no problems finding an iconic pose you are happy to display him in. It’s just about as ideal as we could have ever wished for and finds a perfect balance between getting his physique just right and allowing for a great range of movement… I came very close to a full score here! I already said I wasn’t going to undress him, but I did find an eBay seller here who is selling the base body parted out, and you can get a pretty good look at it here. In this day and age it seems like every super hero is getting a ‘real world’ makeover at the movies. 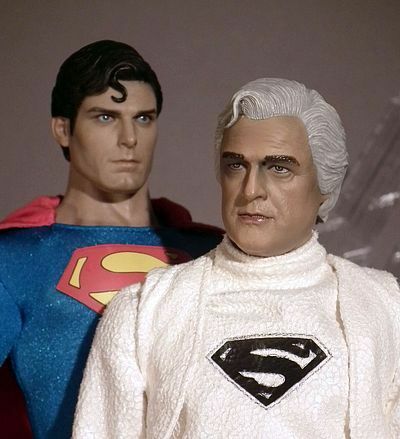 If you’ve seen any early pics of Henry Cavill as Superman from Zack Snyder’s ‘Man of Steel’ due for release next year you’ll be aware that he’s also had an indestructible silicone/latex/nomex/kevlar/alien fabric makeover. 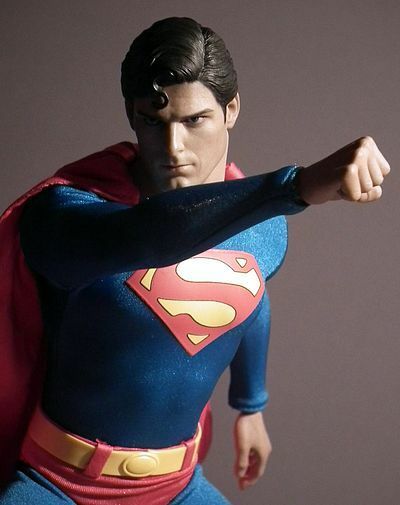 I’m crossing everything I have in the hope the movie will work, but back in the day, when super heroes were happy to strut their stuff in spandex so tight you could see what they’d had for breakfast, and of course keep their undercrackers on the outside, then Superman reigned supreme! 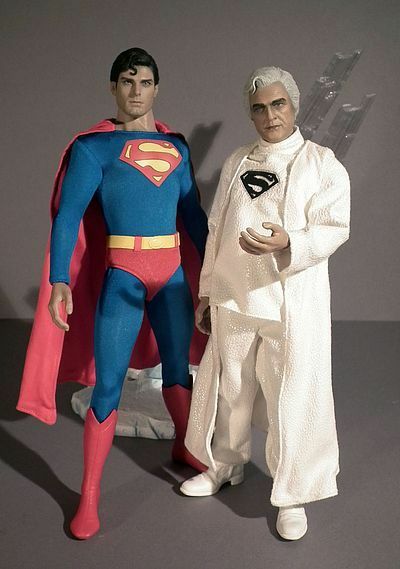 And here we have a great reproduction of that classic 70’s outfit at 1/6th scale. It’s as tight as is needed and works very well with the new base True-Type beneath. All the striking primary red blue and yellow colours are matched to Pantone� perfection and the ‘S’ logo on the chest is wonderfully replicated with just a hint of embossing to give it real quality and indeed tactile finish. The simpler yellow version on the reverse of the cape is also carried out well, with both being stuck solidly to the fabric. 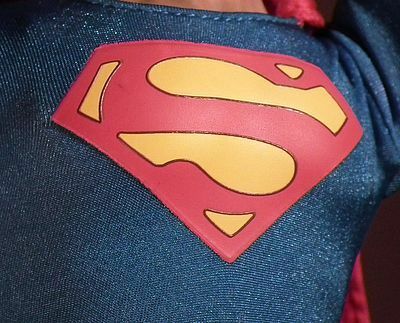 Unlike the recent Spider-Man figure Supes is not physically sewn into his outfit, as that iconic red cape acts as a screen for the zipper concealed down his back. Four small press studs help keep the cape in its optimum position and a fine wire concealed in its hem aids greatly in posing. However, should you decide you need to disrobe the figure at any point it all looks perfectly doable. I did consider stripping him off to get a look at that new body, but decided if I was unable to get the outfit back on as well as it looks now, straight out of the box, then I’d be gutted, so he’s staying fully clothed. 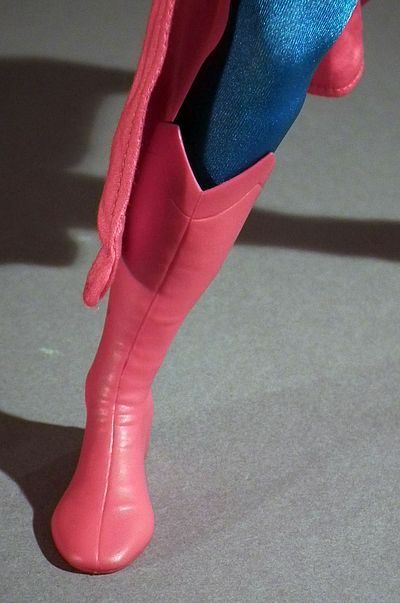 The boots are also nicely done, and being fabricated from some kind of soft vinyl they afford a reasonable range of motion at the ankle (though not a full point for flying poses). And they are also stiff enough to allow getting him into some great standing poses without the need of any annoying stand. The one word of caution I will give you is DON’T try and remove the belt, the instructions say this is a big no-no, and also make sure your nails are clipped and filed, because the nature of the shiny tight spandex utilised here is that a scratch or pull could be devastating… be warned! He doesn’t exactly come laden, but the few things you do get (especially with this exclusive version) are pretty impressive. 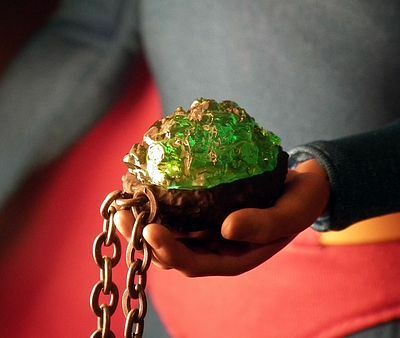 Lets get that exclusive piece out of the way first, it’s the lump of green Kryptonian meteorite on a chain that Lex Luthor uses to disable the Man of Steel while he attempts to use nuclear missiles to set off a chain reaction at The San Andreas Fault in a his dastardly property swindle. 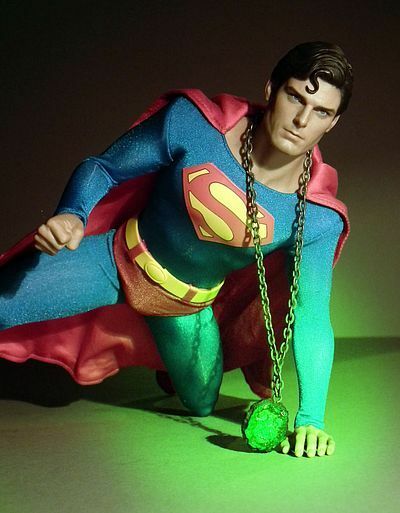 It comes on a real metal chain and the Kryptonite itself is a vivid crystalline, translucent green with a dark grey burnt meteorite reverse. It all looks pretty good, and hangs around the neck with some convincing weight. He also comes with a selection of six hands, two fists, two relaxed and two in the classic fingers tight together flat out flying position. And even though a set of spare wrist pegs is included, I found they swapped over easily so I doubt very strongly that you’ll need them. 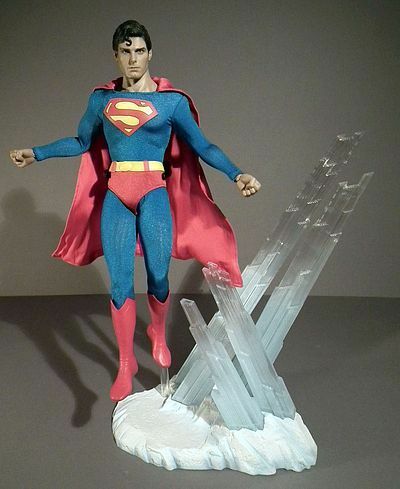 There is also the classic black oval figure stand included, but again it will stay in the box, as firstly the figure can stand just fine without it and secondly a far more impressive Fortress of Solitude base is included. This has large semi translucent shards of ice crystals erupting from the snowy base; there is also a hole within it that a clear plastic rod can be inserted. 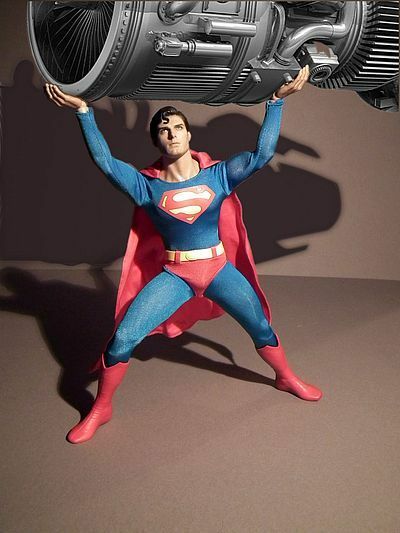 This rod has an adjustable waist grip meaning you can also pose Supes in mid take-off or landing positions. This base is the thing that pushes me to award such a high score in this category, its so damn cool I love it! I’ve had a ball posing this guy in a whole raft of positions, but I’ve had the most fun trying to get him in convincing flying poses over his cool base. The figure itself is well constructed and robust, but as I said above, make sure your hands are clean and your nails are well cut and smooth. Because if you don’t the outfit could look tatty in no time at all. 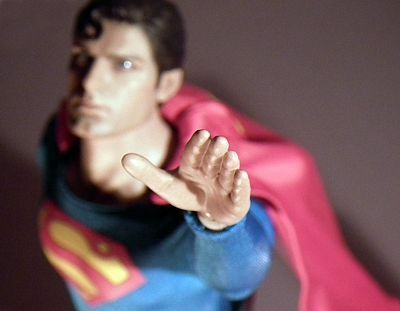 I seldom feel it necessary to mention where you display a figure, as we all know the damaging effects sunlight and dust can have on our collectibles. But more than ever I would say make sure this is behind glass where possible, and certainly not in direct sunlight, as the beautiful bright primary colours of that outfit could be sun-bleached very quickly. In short, as long as you exercise care there are very few problems you will encounter, and you will have one hell of a display piece. I really am impressed with the ice-crystal base, and for me it adds a lot of value… but the RRP of $210 really is rather heavy on this occasion. And yes I know a proportion of the money is going to the Christopher & Dana Reeve Foundation which is a great thing, but without knowing exactly what that percentage is, it does make one wonder just why it is so very expensive. The price of $210 is however the full RRP, with just a little rooting around you should be able to find it for at least $10 less and maybe even $20 if you are lucky. I based my score on getting him for $180, so you can take an extra half a star away if you are forced to pay full retail. I recently opened a whole nest of vipers by not giving the DX06 Jack Sparrow figure a full **** score. Being a critic it is sometimes forced upon you to explain your rationale, and why you award differing amounts. Mostly it’s based on looking at the scores awarded in the different categories and awarding what you think is fair ‘overall’ score taking all of its strengths and weaknesses into account, but there is also a gut feeling that plays just as big a part. For me the hefty price tag on the Jack Sparrow lead to me just keeping him short of the full mark by a � and with Supes here I was tempted to do the same. However, although the DX06 is without a doubt the best Jack Sparrow I own, I do already own a few others. 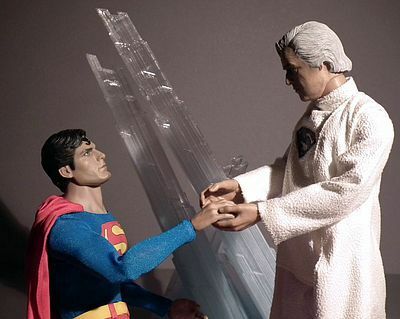 On the other hand I have never yet owned a good quality figure of Christopher Reeve as Superman, and just a year ago I still thought there was a good chance I never would. 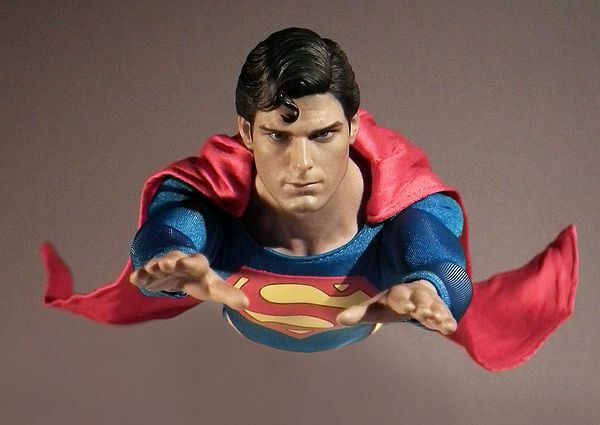 And knowing Hot Toys are going to be giving some of the profits to charity has pushed me to feel charitable myself, how could this stunning figure be anything less than a full score! The regular version is still available from Sideshow for the full RRP of $210 here. But he also still available at Mikes sponsors below for up to $21 less. And eBay prices are ranging between $189 at the low end for the regular right up to a top whack of $350 for the exclusive edition.